I still like to buy a daily newspaper. This used to be normal, but has become increasingly unusual. The Sun, Telegraph, Mirror and Express sell half as many copies as they did ten years ago. The Times and the Mail are down by a third. The Independent no longer bothers to print on paper, which leaves the Guardian as the lowest selling of the major national papers. Its daily circulation is down from 384,000 to 157,000 over the last decade, and the paper is losing money hand over fist. So today they're doing something about it. In the heady days of 2005, before cost-cutting became a national way of life, The Guardian decided to splash out in a new direction. A bold decision was taken to change the size of the newspaper from broadsheet (60×40cm) to Berliner (47×32cm), rather than slimming all the way down to tabloid (43×28cm). This would make the paper distinctive but still serious, and continue to allow for the publication of long stories with large pictures. One problem. Although various European newspapers published in the Berliner format, no other British daily did the same, which meant there was nowhere in the country to print the newly-shrunken paper. The Guardian therefore had to invest in brand new printing presses, at a cost of £50m, and then spend another £30m building facilities to house them in. 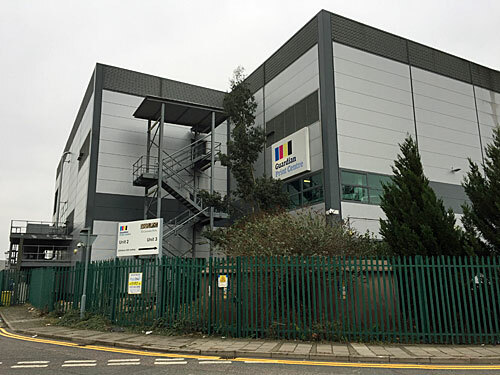 Two new print sites were established, one in Trafford Park in Manchester and the other in Stratford, London. I live within a mile of the latter. The Guardian Print Centre for the south of England is a big grey box on Rick Roberts Way. 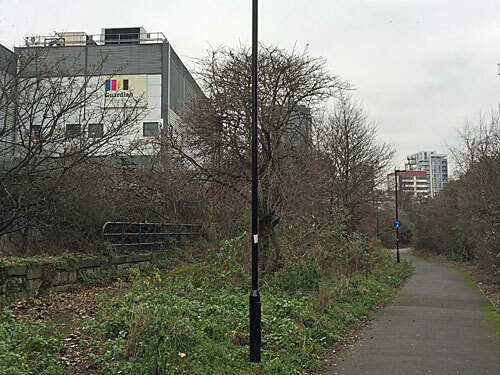 It's part of an industrial hinterland which survives to the south of Stratford High Street, away from the Olympic Park, along a grim back road not yet lined by flats. Specifically it's part of the laughably-titled International Business Park, a cluster of four large warehouse units watched over by separate security barriers. Unit 1 belongs to Kesslers, a long-standing company which produces display cases for shops and department stores, because somebody has to. Unit 3 houses St Clements Press, the Financial Times' printing operation, so must be full of rolls of salmon-tinted paper. Unit 4 is a Mercedes Benz service centre, and moved here from what is now West Ham's football pitch in the centre of the Olympic Stadium. 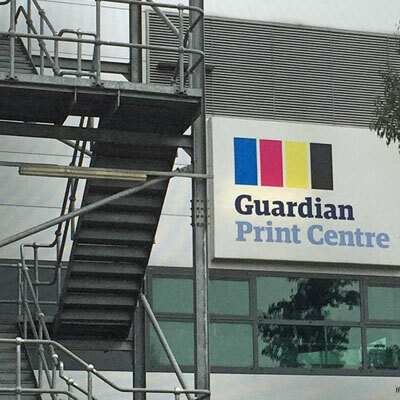 The Guardian prints in Unit 2. From the outside, it's all somewhat featureless. There's one corner with windows which must be office space, there's a fire escape, and there are big doors to reverse lorries up to. There are also a couple of signs announcing the name of the building, written in the 2005 version of the newspaper's typeface, with four stripes in black, cyan, magenta and yellow, because printing in full colour was still a bit of a big deal back then. Shuffling up one side of the Guardian Print Centre is one of the most miserable footpaths in Stratford. This follows the line of the culverted Channelsea River, now a forlorn track bedecked with lager cans, supermarket trolleys and just enough blind corners to make you nervous. Right outside the Guardian's front gate a makeshift staircase has been constructed out of stacked pallets, allowing workers to take a shortcut rather than walking all the way down to Abbey Lane. They won't be needing that any more. Today the Guardian relaunches in tabloid form, as financial pressures finally force the abandonment of its Berliner dream. 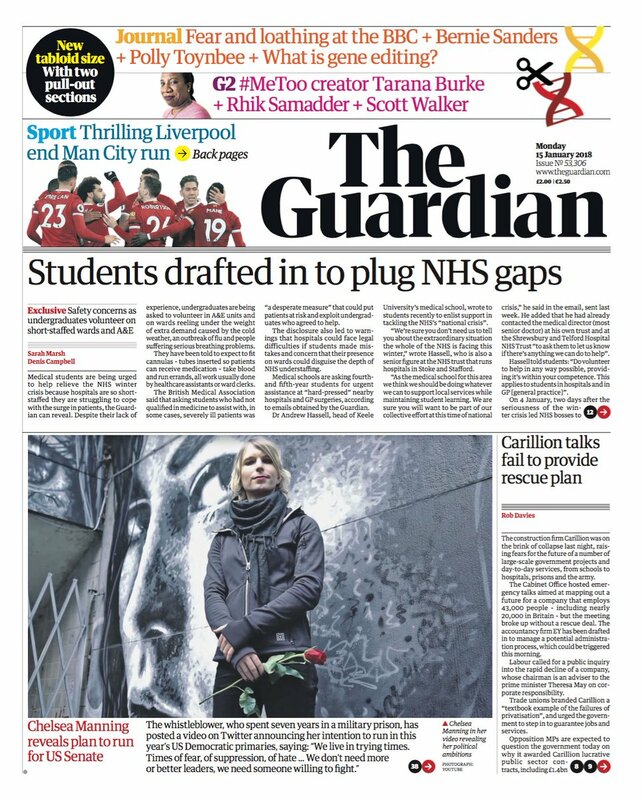 The new size means the Guardian no longer has to print the papers itself, so a cheaper contract has been signed with Trinity Mirror to do it instead. They have five sites nationwide - in Glasgow, Teesside, Oldham, Birmingham and Watford - which means the Guardian will now be rolling off the presses with the Daily Mirror, saving millions of pounds every year. We all know why newspapers are in trouble, namely the availability of news online, which means most of us now carry a much more up to date source of what's going on in the world in our pockets. Why shell out money for news, or pay to look behind a paywall, when you can get regular updates from social media with ease, or pick up a freesheet at both ends of your daily commute? But I still appreciate a proper newspaper, a daily collection of news curated by an editor, rather than some branching tree of online links. I appreciate journalism, rather than press releases rehashed for clicks. I like to be presented with a broad range of stories, home and international, rather than only reading those which fall within my comfort zone. I like a big page I can scan, rather than a tiny screen which reveals stories three sentences at a time. Even filling in the crossword is much easier on paper than tapping away at individual letters with clumsy fingers. I love online media for its immediacy, but the benefits of a printed paper still lead me to shell out. Alas it seems newspapers are becoming harder to buy of late. Former newsagents have given up stocking them, devoting the shelf space to cans, crisps and chocolate instead. Newly opened corner shops and convenience stores always focus on food and drink rather than the printed word. Even the News Kiosk outside Bow Road station now stocks fewer titles, and fewer copies of what's left, having recognised that Red Bull and chewing gum are what the local demographic really wants. As recently as last week the kiosk's owner replaced his newspaper shelf with a rack of penny sweets, leaving what newspapers remain to squeeze onto the front counter in the Oyster top-up zone. Just as fewer newspapers being sold leads to fewer places selling newspapers, so fewer places selling newspapers will lead to fewer newspapers being sold. The long-term decline of paid-for print media is inexorable, now digital dominates, meaning it's more a case of when each title succumbs rather than if. 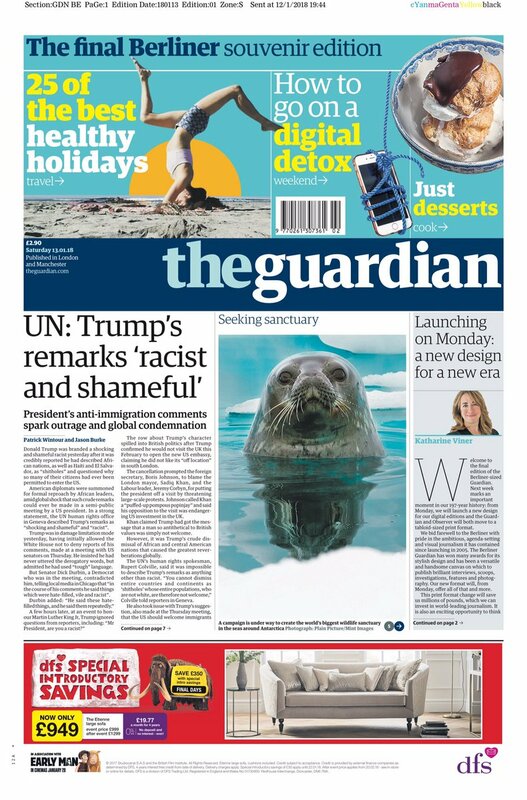 But I'll still be out to grab my tabloid Guardian this morning, and again tomorrow, relieved that at least my chosen newspaper hasn't yet sunk beneath the surface. It may no longer have the stature it had yesterday, but at least it'll be easier to open on the train. To save time, why not pick one of these ten digital codes rather than trying to compose a lengthy argument in the comments box? Get with the program, grandad, newspapers are dead. I never buy newspapers, so I don't see why anybody else would. Morning newspaper? Pah, I'd rather buy a coffee instead. I used to buy a newspaper, but now I just play Candy Crush. Get a tablet and a subscription, you don't know what you're missing. I always knew you'd be a bloody pinko Guardian reader. Don't knock the freesheets, some of their celebrity gossip is ace. I prefer YouTube, so I never read or watch any news ever. 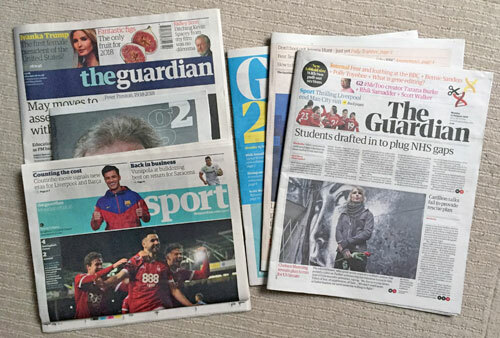 The new tabloid Guardian is symbolic of the paper's decline. I too enjoy a good newspaper, and buy one daily.